Did you know that in the southeast United States, it’s considered rude to invite people to a wedding that takes place between September and the first weekend in December? Why is that, you might ask? It’s because it’s during college football season. Your guests are probably fans of a certain SEC or ACC school and they’d rather be planning their party or better yet, tailgating and not attending a ceremony. Go ahead, roll your eyes, laugh it off if you reside anywhere west of Texas, north of Virginia or somewhere else where they play college football on a day other than Saturday, but it’s true. I am a proud alumnus of the University of Georgia. Home of the Bulldogs – 2017 Southeastern Conference champions. I live five miles from Sanford Stadium, have been a season ticket holder since 2000 and produce a podcast titled, “Waitin’ Since Last Saturday” with my buddies Will Leitch and Tony Waller. Our show is wholly dedicated to covering the Georgia football team throughout the season and with three full seasons and 138 episodes in the books, we cannot wait until the 2018 UGA football season. The University of Georgia campus is located in Athens-Clarke County. Many parts of the city and especially north campus are quite photogenic with the rolling hills, unique building architecture and historic landmarks. 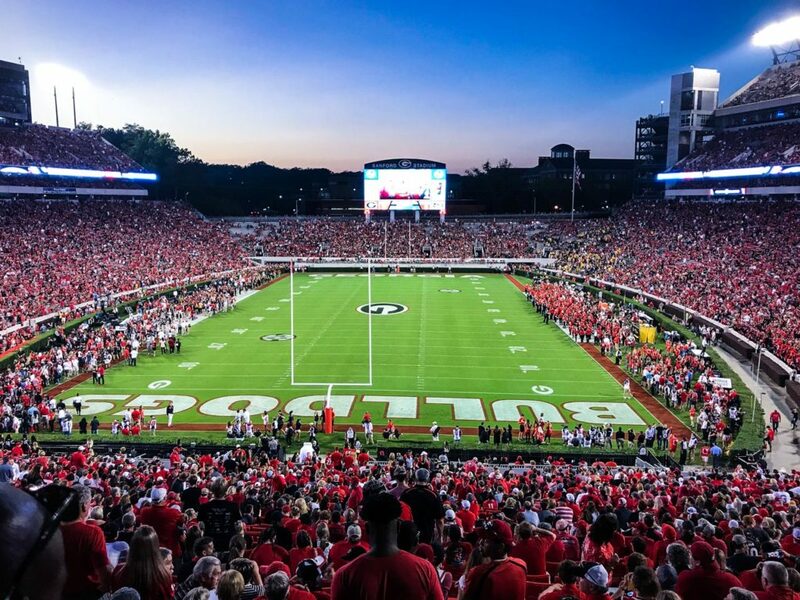 During football season, the centerpiece of the county and university is Sanford Stadium. It doesn’t stand out like many other stadiums around the country. Instead it’s built into campus and sits down in a bit of valley as the university has grown up around it. Where exactly is Sanford located? Just follow the cost of parking and tailgating spots on any Georgia home game and as the price and scarcity of prime parking spots increase the closer you get to those 92,746 seats. Out of the six to seven home games that the Bulldogs play every year, I try to attend all of them. 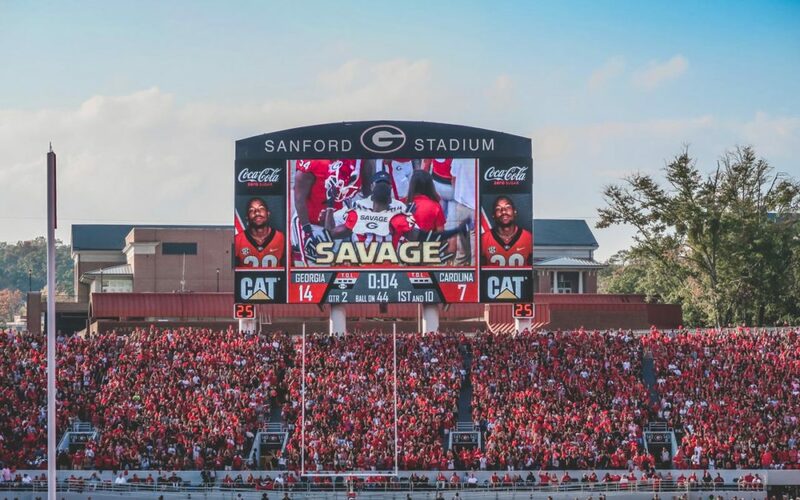 Sometimes, I’ll just go and tailgate and give my ticket to a friend or family member who doesn’t get to experience the thrill of watching a game “Between The Hedges” as often as I do. But every time I set foot on campus on a Saturday in Athens, I’ll have my camera with me. I take some photos, for my own Instagram feed or my podcast’s Instagram, but I’m mainly focused on filming. First things first. I did not set out at the beginning of last football season planning to make any videos about my experiences going to Georgia football games. I have taken some kind of camera (iPhone, Canon G7X, GoPro) to Georgia football games for years. Most of the time the photos and videos I get stay sitting on one of the many external hard drives at my home. But last year was different. In the spring of 2017, I made a short video edit of my kids and my experience of UGA’s annual G-Day game. It was something new and I thoroughly enjoyed piecing it together. Then came last year’s season opener when the Dawgs played Appalachian State. The game was exciting, Georgia won and I felt as if I had some good footage. So I put a quick edit together for my Instagram feed. I continued filming at games that I attended and the watch parties of games I didn’t attend throughout the season. 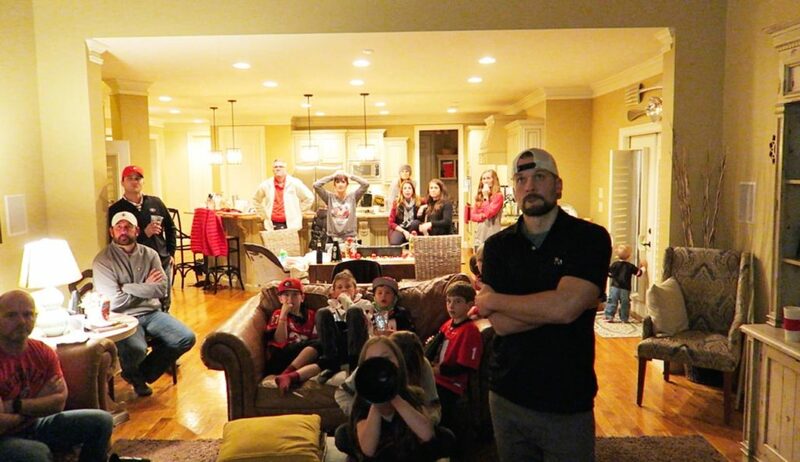 So by the end of the year, after Georgia had won the SEC Championship, I had over 200+ individual clips of amazing catches, epic tailgates and friends and family dressed proudly wearing their red and black. But, I still had no real intention to sit down and edit anymore UGA-themed videos, until the Rose Bowl happened. January 1, 2018. The Dawgs were set to play Oklahoma in the Rose Bowl. Georgia had not played in the Rose Bowl since 1943. Not only is the game considered one of the most prestigious bowl games, but also UGA was in the four team college football playoff. A rosy victory would put the team in the National Championship game. I set out like I had many other times by capturing my family and me getting ready to go watch the game at a friend’s house with about five other couples and their kids. However, this time I did something a little different. I placed my camera on my 4Runner, hit record and actually set up the shot by speaking to the camera like I was a vlogger. Since the game was so historic, I wanted to at least give myself half a chance to put a video together that my kids and friends would potentially enjoy (if Georgia were to win the game). My WSLS Podcast Co-Host, Tony Waller & His Wife Celebrate UGA’s Rose Bowl Victory in Pasadena. 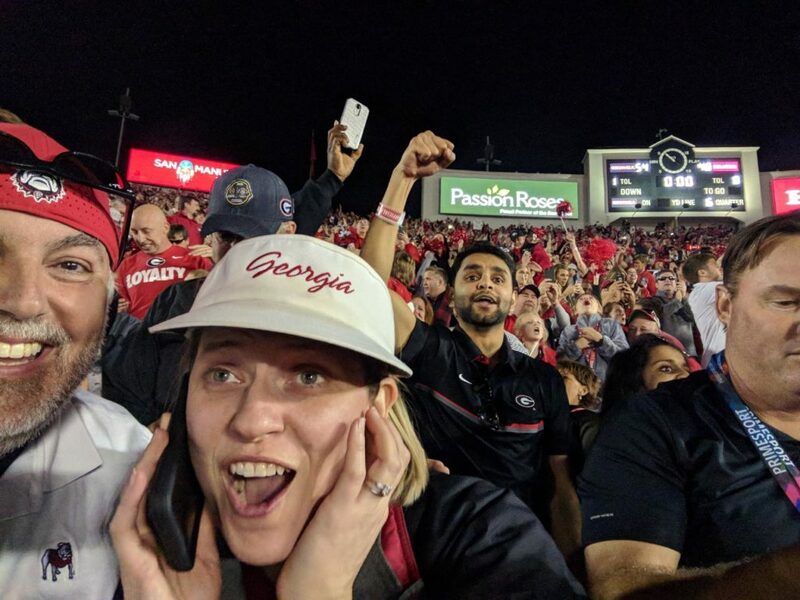 In one of the greatest Rose Bowls or college football games, really, ever played – the Dawgs were victorious 54-48 in a double overtime thriller that sent every Georgia fan from the east coast all the way out to California into an absolute insane celebration. I captured it all from our perspective too. Throughout the game, I kept setting my camera up right under the television that our entire group was watching the game from. Every now and then I’d move the camera and focus on myself and others watching every gut-wrenching moment. You’ll notice in the video as the Dawgs fell behind late in the 4th quarter, I actually reach for the camera and shut it off. I wondered why I was wasting so much time and energy into filming my soon-to-be misery. Screen shot from Rose Bowl Video. The tension was way up there. Yet, the Dawgs rallied again with a late Nick Chubb touchdown run in regulation to tie the game. Then the first overtime came and went, which led to the dramatic blocked kick by Lorenzo Carter (a called shot by the kids that you’ll notice in the Rose Bowl video) and a historic run by Sony Michel to seal the game and send the Dawgs to the National Championship game. I allowed a day to pass by before I even looked at the footage, but after the adrenaline wore off, I sat down behind my computer and came up with this edit. To date, this video has done almost 97k views on YouTube and 70k views on Facebook. That’s pretty viral for a guy who has 215 YouTube subscribers. After the Rose Bowl video experience settled down, I was excited to make a follow up video for the National Championship game. The result was one of the most disappointing games I’ve ever been to in person, crushing would be a better term. Yet, after a few days, I was able to gather myself and put together a nice postscript video edit for what turned out to be a one of a kind season for Georgia. I titled it, “A Bad Ending Doesn’t Ruin Georgia’s Season“. So yeah, making videos about Georgia football is something that the 2017 season helped me understand that I really enjoy doing. I’d be remiss if I didn’t admit that it is also a great way to help market my skills as a videographer and video editor. I booked quite a few new jobs from the popularity of the Rose Bowl video alone. When April 2018 came around and another G-Day took place, I uploaded a fun video that helped look forward to what we plan on experiencing – as Georgia fans – in the fall. This change in mindset of actually shooting deliberately and with a thought to how the story will go helped me be a better creator of videos. It’s not client work, it’s just fun. We all have our talents and passions. Video capture and video editing is one of mine. There was a moment at the end of July that I noticed a proliferation of UGA hype videos for people getting excited for the dawning of a new college football campaign for the Dawgs. I watched a few that showed up on my Twitter timeline and the rush came back to me. I remembered all of the footage I had shot last fall, how much fun it was to create the Rose Bowl, National Championship and G-Day videos and thought to myself, surely I had enough decent footage from the 2017 season that I could make another video. And, once I found the perfect piece of inspirational music via Epidemic Sound all I needed to do was sit down with all of my footage, close my eyes to visualize how the music was flowing and just pick out the footage from my archives. I enjoyed putting this new video together and I hope you enjoyed watching it. Feel free to reach out to me via email or on social media with any comments or questions. Just don’t invite me to your wedding this fall.